Some previous sewing experience is necessary to make the most of this workshop. We will be creating a square picture so it will fit a commercial square box frame. Working from photographs you will create your design. Don’t worry if you cannot draw. The design work will be about identifying the key elements to include, the colours and textures. You may not be able to finish it completely in the two days however you will have the structure in place and may need to add some final stitch at home. The course will combine tutor demonstration, hands-on experience and be supported by comprehensive notes so you can use the techniques again at home. If you have a particular landscape that you would like to use for inspiration please bring photographs. However, some images will also be available. Please bring a sewing machine with bobbins, needles and a variety of machine threads – these can be colours in your image or colours you love. Grass doesn’t always have to be green!! Hand sewing needles and embroidery threads in a variety of colours. I particularly like variegated threads – both machine and hand. Your tutor will provide material, paint, bond-a-web and a range of other threads will be available to use. Kay Leech is a mixed media textile artist whose passions are colour and texture. Working in mixed media textiles enables her to create highly textured works using paint, print and collage coupled with hand and machine embroidery. 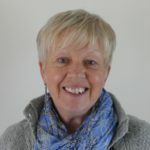 She exhibits both as an individual and as a member of ButterFactory and the Eden Valley Artistic Network (EVAN) with work in local exhibitions, galleries and the Scottish Quilting Show. In 2017 Kay was awarded the first Friends of Higham Scholarship which linked textiles and geology and culminated in her exhibition ‘Connections’. You can see her work at Textravaganza, 8th and 9th June, Rheged, Penrith and also 15th to 23rd June – EVAN Art Trail and Open Studios.